At just 25-years-old, Kane Brown is at the top of his game and has no plans of slowing down. The Georgia native burst onto the scene a few years back, steadily gaining notoriety through social media and amongst country music circles. But there's no doubt 2018 has been Kane's most successful year yet, having made strides both professionally and personally. So how did this one-time aspiring singer harness the power of the internet and a great voice to become a global country sensation? It's a modern-day story for the ages. While Brown first rose to prominence in 2013 by posting performance covers online, many musicians in the industry didn't take him seriously. "Even Luke Bryan," Brown recalled to the Washington Post, "it took him eight years going bar to bar and just playing. With me just coming off social media, a lot of radio people were like, ‘Who is this dude?'" It wasn't long until his songs were getting just as much radio play—if not more—as his idols. After releasing his first EP, Chapter 1, to rave reviews, Brown stepped up his game and announced his self-titled album at the end of 2016. The album reached platinum certification and turned Brown into a bonafide country sensation. By the end of 2017, Brown found himself once again making history. He became the first-ever artist to top all five Billboard country charts at once with songs "Heaven" and "What Ifs," the latter of which was a duet with his former middle school classmate Lauren Alaina. "She has one of the best voices in Nashville, and she got me here. I followed her path, just a different way," Brown revealed to the Tennessean about his collaboration with his old friend. As for Alaina, Brown's success came as no shocker to her. "He was just killing it, and I kept seeing the views go up and up and up and up. 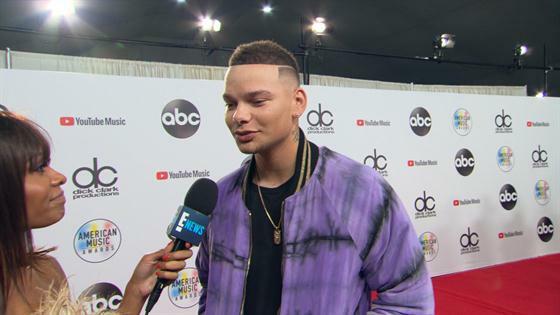 The next thing I know, he's Kane Brown…He's always been Kane Brown," she shared in an interview. With some major credits under his belt, Brown joined Brad Paisley for his summer tour. While being on tour with one of country's biggest superstars did help gain more fans, it didn't solidify Brown in the eyes of the music industry. Despite finding major commercial success, the 2018 Country Music Awards snubbed Brown in a major way by not nominating him in a single category. Brown wasn't too happy about the snub, writing in a since deleted tweet, "So what's a man gotta do to get nominated lmfao just wanted to say my fans are the s--t and i love y'all." He more than made up for his snub, however, at the 2018 American Music Awards where he won all three categories he was nominated for. Taking home the awards for Best Country Album, Country Male Artist and Country Song for "Heaven." In fact, he once again made history by being the most awarded country music star who had never won an AMA before. As if that wasn't enough, in the last year Brown also added the title of husband to his resume. The country crooner settled down with singer Katelyn Jae in October, right off of his AMA victories. Now, his forthcoming second studio album Experiment may be the most wildly anticipated album of the year. Even with all the hype and haters, Brown is only focused on making the music his fans want to hear. "I don't think it's about sending a specific message. I try to focus on my fans, who I know have been there since day one. This is about us all building something together," he told Billboard.